Here's why Dallas is such a great place for retirement. Living in Dallas comes with many perks, including a vibrant culture, a pleasant year-round climate, an affordable cost of living, and never-ending recreation opportunities. Dallas is also a dream destination for many retirees. Big D ranks among the best American cities to retire, according to a survey from Provision Living. Miami landed at the top of the list, with Dallas coming in as the No. 1 Texas city to retire and No. 11 overall. Here are just a few reasons retirees are drawn to Dallas. In Dallas, active adults have all the excitement of one of the country’s largest cities right at their fingertips. Dallas boasts an eclectic music scene, from Deep Ellum to the Granada Theater. Active adults can also explore a range of interesting and thought-provoking museums in Dallas. Sports fans can experience all the energy of watching a professional team in action, including America’s team, the Dallas Cowboys. Retirees who appreciate a good meal will savor the city’s exquisite dining scene, which boasts many five-star establishments such as Abacus and The French Room, which received the highest rating of any American restaurant by Zagat. The city is also home to a variety of colorful destinations such as All Good Café or Babe’s Chicken Dinner House, where diners can dance the hokey-pokey. Individual neighborhoods within Dallas also boast an assortment of eateries and establishments that have become local favorites. 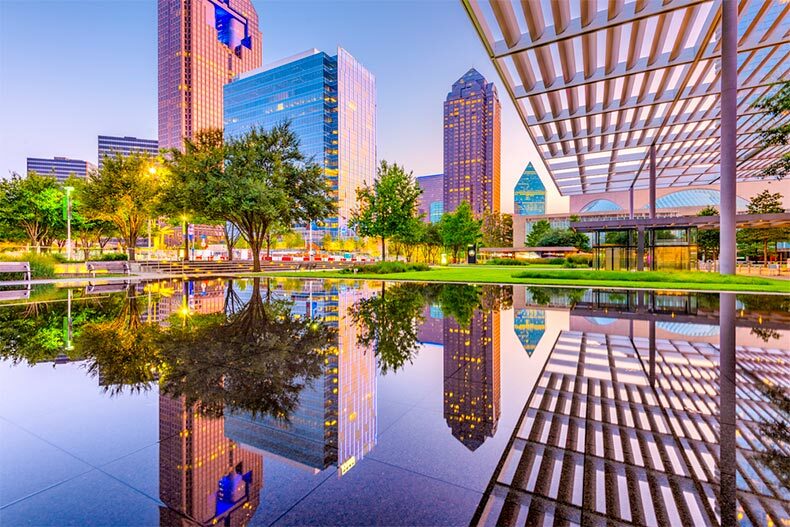 From the glittering skyline of Downtown Dallas to the city’s many lush green spaces, Dallas stands out as one of the prettiest cities in Texas. In Dallas County, active adults can pursue their favorite recreational activities at four sparkling lakes. Joe Pool Lake offers 7,500 acres for fishing, boating, or swimming the day away. At White Rock Lake, just five miles north of Downtown Dallas, retirees can watch the sunset over the water or spend the day kayaking, fishing, or bird watching. Living in Dallas means active adults are always close to some of the world’s best medical facilities. Dallas-Fort Worth is home to several of the best hospitals in Texas, including UT Southwestern Medical Center, which ranks No. 1 in the Metroplex. Retirees can also receive topnotch care at Baylor University Medical Center, which is nationally ranked in two adult specialties and offers more than 20 medical specialty centers. Whether retirees need a general practice physician or specialized care, it’s easy to find at one of Dallas’ many area hospitals. Retirees who want to escape the snow will delight in Dallas’ climate. The city offers an enjoyable climate all year long, with average temperatures hovering around 46 in the winter and 84 in the summer. However, locals know temperatures often soar much higher in the summer, so they prepare by staying hydrated and limiting their time outside. Dallas is also sunnier than most of the country, averaging 232 sunny days per year compared to the U.S. average of 205 sunny days, according to BestPlaces.net.